Dogs need as much as 60 minutes of exercise each day. Doggies need physical exercise and mental stimulation. They are social creatures so if they are left alone, they can become bored and destructive. Keeping your dog physically active and providing mental stimulation are the keys to alleviate his boredom while you're away. Walk your dog. Walk your dog before you go to work, and walk him when you get home from work. Exercise helps relieve pent-up energy. If you have a working dog, consider a backpack with compartments for weights. Fill up bottles with water and place them in the compartments. Working dogs need that extra exertion so they tire more easily. Change your routine. 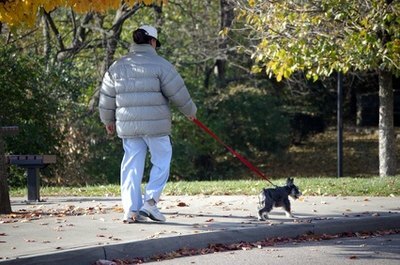 When walking your pup, try different routes. The new sights will keep his attention. If he rides in the car with you, take alternate routes so he gets different views out the window. Visit different friends to give him new social experiences. Add sound to his environment while you are away. Put on the radio or TV. Classical music is soothing and talk shows give him human voices. If you want to calm him, consider a sound machine set on the ocean or rain setting. Avoid the thunder setting if your dog barks at approaching storms. Provide him with plenty of toys. Puzzle toys with hidden treats or peanut butter smeared inside the toy will keep him busy. Squeak toys are great for some dogs. Observe the toys that he likes the most and make sure you have plenty of them. Switch them so he doesn't get bored with the same ones. Play with him when you are home. If he is a retriever, play catch with him. If your poodle loves to dig, hide treats in a hole in the yard. Purchase a doggy board game. Board games are available at your local pet store. Teach your dog a new trick. Dogs love to please their master, and teaching him to roll over or sit can be accomplished in short bursts of time. Provide him with a view. Whether you are home or not, your pup wants to see the world outside. A window on the backyard gives him a chance to view the birds and squirrels. Avoid a window on the front street where the neighbors walk. He might bark at them all day. Consider getting him a companion. Bringing another dog into the home is a major decision, but most dogs do better if there is another dog in the house. Leave a piece of your clothing for your dog to sleep on. The scent will calm him. Never use a crate as punishment. Keep his crate a positive experience. Do Boxers Do Well Eating Bones?